I try to grow basil or my parents do every year and sometimes it does well, but this year the basil we grew from seed did better than the basil I bought at the nursery. So some neighbors who always have such an incredible garden because they use their compost as soil, let me pick as much basil as I could have. So I made about ten batches of pesto and froze most of it. An older friend just loves my pesto so I’ve been giving her some of my bounty. I always feel that basil is so precious because it seems so fragile. Just notice that grocery stores have to sell basil as a plant in soil and you see how hard it is to keep fresh. I love pesto way more than I like hummus, mainly because it feels special because it is associated with summer. Hummus feels like a meal, but pesto just lightens up meals. 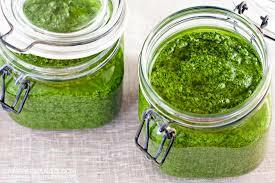 There are lots of ways to make pesto such as with kale or other greens. I looked up a recipe of sun dried tomato pesto and that looked really complicated. Part of the reason why I like making pesto is you don’t have to cook anything. It feels like something Europeans would make a lot and it’s such a simple thing to make that you can substitute many things and it still tastes great! Pesto is probably not as healthy for you as say beans, but it’s a condiment that you’re only supposed to use in small doses anyway right? I freeze my pesto in ice cube trays to save for when it’s cold and dark and only pesto will make me believe summer is coming again. « Why cook when you can be an food artisan! A real respected food writer! Could it be true? More hummus stories! How to make Tabouleh- something I hope to make more often!